My wife, Sheila, and I are looking forward to attending the opening of Mary Jones World at Llanycil, Bala, north Wales, on Sunday 5 October 2014 – the bicentenary of the death of Thomas Charles from whom Mary received her Bible at the end of her long walk across Welsh mountains. Mary Jones World is the realisation of a dream Bible Society has been praying for – to see the story of Mary Jones and Thomas Charles told to a new generation. A new state-of-the-art visitor and education centre will give residents of Bala, Gwynedd and Wales the chance to learn about the Bible’s impact not only on the Welsh nation but the world. For a wider audience the centre will celebrate the birth of Bible Society which has grown from its roots in the foothills of the majestic Snowdonia National Park to nearly 150 Bible Societies around the world. Here, then, is the fifteenth instalment of the story of how Mary Jones and Thomas Charles triggered a mission to the world. In September 1862, Lizzie Rowlands (née Jones) left Bala to become governess to the children of Griffith and Elizabeth Jones of Gwyddelfynydd, just north of Bryncrug. Mary Jones was now 78, blind, and had been a widow for at least eight years, possibly longer. 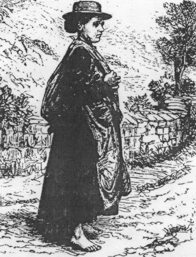 When Mary heard that a new arrival to the area was from Bala, she asked to see her. Lizzie, then eighteen, called to see Mary on her way to a prayer meeting. She knocked on the door of Mary’s little cottage and heard a weak voice. Lizzie lifted the latch and went in. “I don’t know who is there,” Mary said. Lizzie Rowlands never forgot her first sight of Mary Jones. Her features remained vivid in her mind for the rest of her life: she was thin, living in a small cottage with an earth floor, a small table with a rush-candle on it, and two or three three-legged stools. She wore the old Welsh dress, a petticoat and bed gown, blue and white gingham apron made of linsey and a long cloak and hood, a plain cap and kerchief on her head. At the mention of Bala, Mary brightened up and began to talk freely. From that day, Lizzie visited Mary almost daily for two years. Mary wasn’t entirely housebound. To go to Bethlehem chapel, a few hundred yards down the street, she wore a “bird’s nest hat”, a blue homespun cloak with hood, and carried a stick in her hand. In the winter she carried a lantern, not to light her way because she could not see – but so that others could see her. Sometimes when Mary was depressed and concerned about her own sinfulness she repeated Job 23, especially Job’s words “Oh, that I knew where I might find him” (verse 3), with tears in her eyes. When feeling more cheerful, she asked Lizzie to read to her from John’s Gospel, since it contained the words of the “Man” himself, as Mary liked to refer to Christ. Shortly before Lydia died of tuberculosis, in June 1864, she gave Lizzie one of the three Bibles Mary received from Thomas Charles. This Bible eventually found its way to the National Library of Wales where it is today.